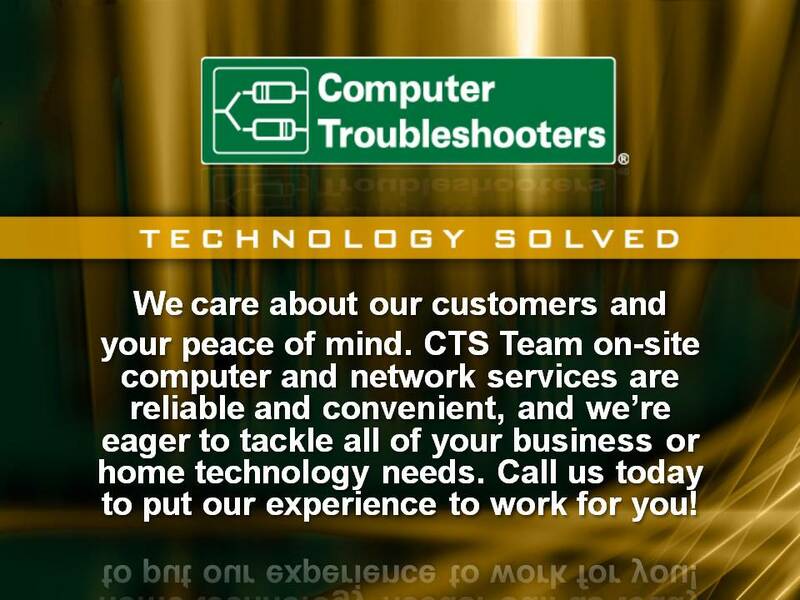 With Computer Troubleshooters (CTS) you get the best of both worlds: friendly, knowledgeable service from a locally owned & operated service provider, supported by the worlds top technology service franchise network. Thousands of small businesses and home computer users around the world call on their local CTS Team to handle their computer, network, internet, and IT consulting needs. We offer our clients unparalleled, global expertise with a personal touch. Not only are we computer experts, but we run close to 100 small franchise businesses across Australia and are computer users too. We know that keeping technology running properly can be overwhelming and frustrating in a small business. After all, who has time to deal with a computer that isn’t working properly? Who wants to worry about keeping their systems up-to-date on security and software issues? Why not let the friendly, local CTS Team experts take care of all your technology needs? We are not geeks, gadget guys, or commissioned salespeople we’re technology professionals. You can count on our trained technicians to work until each problem is solved. Businesses and home users around the world rely on Computer Troubleshooters, and you can too. Computer Troubleshooters is a worldwide franchise team that’s established approximately 500 independently-owned offices on six continents since 1997. Our Global Network Gives Us Rapid Access To A Wide Range Of Experience, Which Helps Us Resolve Your Computer Issues Quickly So You Can Get Back To Work. We should be your first call when you have security questions, need to get your data back when your computer / server crashes or when computer network breaks down, your machine or software needs to be upgraded, or when viruses, spyware, and other malware rear their ugly heads. You don’t need to have a long-term maintenance contract although that’s a service that we do provide to many of our clients. In fact, no matter who you are and no matter what your needs, all you have to do is pick up the phone and your problem is as good as solved, your questions are good as answered.